Just 15 min. from historic Beaufort, 5 min to Hunting Island State Park; 57 miles to enchanting Savannah, 69 miles to thriving Charleston and 12 miles to Parris Island. Beaufort offers all the down-home charm of an older, southern city minus the really big crowds. (However, with more than 2 million visitors per year, it's not entirely disregarded.) History, architecture, the waterfront, a healthy local arts scene and great local restaurants separate Beaufort from other low country locales. Named the cutest town in SC by PowWow.com as the poster-child for adorable towns, it has all the Southern charm you could ever dream of: friendly people, a low-country culture, a slow-paced lifestyle, Antebellum architecture and Spanish moss as far as the eye can see. Décore: Ocean Blue ceramic floor tile, rattan living room furniture with futon, sailor blue bedroom furniture with a queen pillow-top bed and a nautical theme. This first floor vacation condo features a screen porch overlooking one of the island's 3 pools with a view of 3 mile long private, uncrowded beach and morning sunrises. Just 70 yards over the boardwalk, over the sea oats/sand dunes and you're on the beach!! Pets must be well behaved and preapproved. Pet owners planning to bring pet(s) must reserve with a credit card. Pets may require an extra cleaning fee, especially long-haired pets. Close to rookeries with hundreds of herons and egrets. We love to relax and enjoy the warmth of the sun, cool water and carefree attitude in a quiet neighborhood atmosphere with 24-hour security guards at the gated entrance. Take long walks on your own sandy beach. All the pleasures and privacy that a hotel cannot offer. 11 GOLF COURSES WITHIN 15 MILES. And golf is only one of nearby Beaufort’s drawing cards. Just 10 minutes away Camelot Farms provides Equestrian Adventures. It won’t take long for you to discover why movie makers so often choose the Lowcountry as a movie set. Forrest Gump, The Prince of Tides, and The Big Chill are but a few of our credits. July 4th - Celebration in Port Royal and @ Parris Is. The waterfront park is home to many festivals and it backs up to the three-block-long shopping and dining district. Other attractions: the history of the original Gullah community at Penn Center on St. Helena Island and the Santa Elena History Center. Climb the look out tower on Hunting Island State Park for spectacular views. Contact www.beaufortsc.org for information on year round adventure tours, coach, boat and kayak tours, bike tours, walking tours, or horse drawn carriage and touring vans. And don't miss a stroll along lovely Bay Street packed with beguiling local shops. April 3-Oct 2, '13-Downtown Farmers Market - Wed.
For the comfort of all our guests, no smoking is allowed (except on Screened Porch). We actively promote a voluntary smoke-free environment. We ask that all guests refrain from smoking, except on porches. With your cooperation, there will be a direct economic benefit to you and to us through extending the useful life of the furnishings and reducing cleaning costs. Extra fee will be charged for smoking in unit. This is a Lovely condo with everything you need. I came expecting to need something, in otherwords I came OVER EQUIPed. Annette and staff has everything you need to make your 1 night, 1 week or 1 month enjoyable. Just bring the food and your favorite spices and your ready to go. Beautiful Cozy Porch, close to crabbing, fishing and beach relaxing. Beautiful landscape greets you as you enter the property. If you wish to do laundry FREE Laundry on site right outside the condo door. We have made Beaufort our OFFICIAL Home away from home (almost bi-weekly we are in Beaufort) and thanks to our new friend Annette this condo will be another reason to add to our long list 'WHY WE LOVE BEAUFORT'.. SC's own Paradise. What a relaxing, peaceful vacation. The condo was like a home away from home, very clean and inviting. It rained our first night there but the screened porch was a great way to spend a rainy night. We even got to enjoy watching a school of dolphins swim while lounging on the beach. I would highly recommend this property to anyone looking for a peaceful, serene place to enjoy some down time! Harbor is a very peaceful and serene environment, and it is a must see. The condo is very quaint and relaxing. I recommend going to this condo as much as possible. I am retired from the Cooperative Extension Service where I enjoyed a 30 year career as a 4-H agent, Home Economist and for the last 5 years a Cluster Director. I am widowed and have one son (Ty), and six grandchildren ranging in age from 30 to 8. I enjoy dancing, reading, gardening, water aerobics, crocheting, sewing and traveling. And I'm an active member of the Baha'i Faith sharing it's message of Unity. Once I felt the gentle breezes and saw the flowing waters, sandy beach and spacious views of Harbor Island, I was hooked enough to find my property. Remarkable sunrises and sunsets, access to swimming pools, collecting sea shells, walking among the terns, pelicans, egrets, herons and horseshoe crabs, 24-hour security, graceful sand dunes covered with sea oats and coastal grasses, peace, tranquility and a wonderful place to take the grandchildren. shared FREE and Right Next door! Provides an elliptical, 2 tread mills, stationery bike, rowing machine, free weights, weight machines, yoga ball and mat, Blood Pressure cuff. Screened Porch Overlooking Pool and ocean view. Off site and nearby. Golf Cart Rentals Sutcliff rental @ 843-524-6502 also Carolina Custom carts @ 843-441-9968. Open April 15th to Oct. 15th, dawn to dusk. 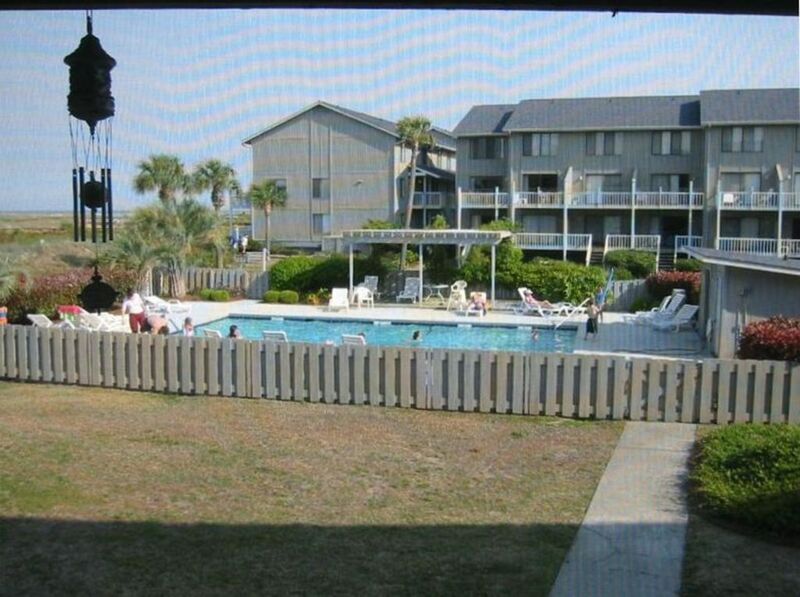 There are 3 pools on the island, one right outside this condo visible from the porch. Loved the screened in porch! Ocean view was beautiful! Owners answered all my questions promptly. They were very accommodating. Parking area was tight. I ended up parking in lot out front of building L. Lots of construction work & noises! We had a very relaxing stay. The condo had excellent views of the ocean and pool area. The grounds were very well maintained with all the lush foliage. There was a very clean laundry room on every floor in our case it was next door so it was very handy. The condo had a screened porch, two flat screen tv's ,wifi and 1 1/2 baths. Everyone at the facility was very friendly. I would recommend this condo for anyone looking for a relaxing vacation. Great location for a restful vacation! We stayed at this condo for 2 weeks and had a wonderful vacation. Just a walk across the boardwalk takes you to the ocean, or drive a few miles to the nearby Hunting Island State Park, which has a great beach by the lighthouse. When the tide is low, you can hang out at the pool. The condo has a well-equipped kitchen, which we used for breakfast and lunch, but we usually went out for dinner. We enjoyed eating at Johnson Creek Tavern just up the road, or you can drive into Beaufort (about 20 minutes away) for any number of different restaurants, often with an ocean or marshland view. Annette and Ty were very good at communicating with us in a timely way when we had a problem. For example, the couch in the living room broke a leg, and it was replaced within a few days. However, we never could get the wi-fi to work. I felt that Ty could have made more of an effort to troubleshoot this problem. He just said the password should work...but it didn't! My phone at least had service, but my friend's phone often had no service at all. Luckily, we were too busy enjoying the beach to worry about it that much. The area is great for birding as well. I saw roseate spoonbills, egrets, sandpipers, tri-colored herons, tons of brown pelicans, and many more. We also drove into Savannah and Charleston on day trips. The whole area is so interesting. We would definitely recommend this condo to others. Great access to the beach and the pool. The condo was perfect, just what we needed for a relaxing week away. I loved the screened in porch. Everything we needed was provided for us, just had to get some groceries. Ben got to do some fishing( sadly he only caught one shifting) but he enjoyed the sport. Thanks so much for sharing your condo with us. The outside property was gorgeous. This was the first time staying at a VRBO. Very disappointed. The front room furniture , a futon to sleep on that all the stuffing was shot, it made sitting on difficult. the chair had a slip cover on back and arms that the faux leather was cracking. A table next to the futon had games in it along with what looked like sticky candy on bottom of drawer. Majority of lighting is ceiling cans which would be fine except they had 60 watt florescent bulbs in them. Had 4 large glasses and all different. Knives in silverware drawer had rust spots. Ice maker did not work. This little place could be a gold mine for owners with some repairs. We read the review from 2016 and your reply about Hurricane Matthew. We will be putting in a sleeper couch and side chair very soon. We have had issues with the ice maker in the past but we were not aware that there was a problem now. That will be fixed. Also didn't realize silverware needs replacing and will handle that. We've had two hurricane hits and overlooked these small but important issues while we were working on larger issues. Appreciate knowing about concerns and opportunity to make changes.